Get ready for Easter and make these wonderful Cookies your family will love. In a medium bowl, beat butter or margarine and brown sugar with an electric mixer on medium speed until light and fluffy. Beat in lemon zest, lemon extract, and vanilla. Add flour and salt to the butter and blend well. With a rolling pin on a lightly floured surface, roll out dough 1/4 inch thick. Cut out cookies using a Easter Cookie Cutters. Place 2 inches apart on un-greased cookie sheets. Re-roll scraps and cut more cookies. 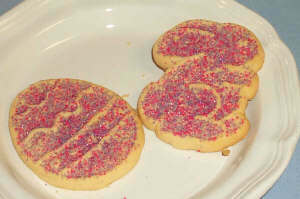 Sprinkle pastel sugar crystals on each cookie. Bake 20 to 25 minutes, until cookies are pale golden, not brown. Let stand 2 minutes. Remove to a rack and let cool completely.